A powerful new kind of competitive advantage is now possible thanks to technological and social disruptions that are already occurring. These disruptions revolutionize how companies can partner to create new growth. 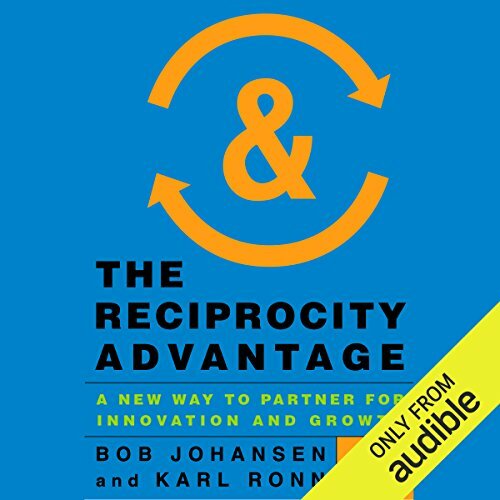 The Reciprocity Advantage shares a model for creating that growth: define your right-of-way (the underutilized resources you already own that you can share with others), partner to do what you can't do alone, experiment to learn, and scale the new business at low risk. Reciprocity and advantage are words that are not normally seen together, but reciprocity - giving now to get later - will become a normal part of winning in the future. The Reciprocity Advantage shows you how to leverage new forces like digital natives and cloud-served supercomputing now into massively scalable, profitable, incremental growth for your business. Provocative and pragmatic, leading 10-year forecaster Bob Johansen and experienced business developer Karl Ronn describe how to lean in to disruptions to create new growth for your business. They include actual cases showing early successes for a range of companies and nonprofits like IBM, Microsoft, Google, Apple, and TED. They then provide key exercises to define your promising new ideas and nurture them into healthy new businesses. Their recommendations are based on practical experience in managing the problems of new business creation and many years of helping others see the future more clearly. Distilled from hands-on work, this book gets you started today on creating your own reciprocity advantage. ©2014 Bob Johansen and Karl Ronn (P)2014 Audible Inc.
Another great book from Bob. Insighful, simple, Bob invites you to prepare yourself and your company for the future, thanks.